« *** WINNERS *** Susan and Heather are Living the Life of Riley! CONGRATULATIONS! My daughter Riley, who just turned two, is on the verge of moving out of the crib and into her very own twin-sized bed! The thought is both exhilarating and scary all at the same time...for both of us. The one thing I do know for certain is that I want her to have a super cute and adorable bedding set to help get her excited about the new transition. I searched all over the internet and found several wonderful solutions, but once I spied the Gardners Friend Quilt Set from American Kids Bedding, I knew this was the one Riley would love! American Kids Bedding generously allowed me to review it too. Keep reading to find out more! I reviewed the Gardners Friend Quilt Set (Twin-Size) from American Kids Bedding, which retails for $95.99, but is currently on sale for $89.99. When Riley was a baby, her nursery was painted with lime green walls and aqua trim and doors. I love these colors and think that they are so bright and fun. Of course, I wanted to incorporate more pink into her room too, since she now loves pink. I was on the lookout for a bright, beautiful quilt set which would incorporate all three of these colors in an interesting and delightful pattern just perfect for a little girl. American Kids Bedding had more variety and selection than I could manage and it took me several hours of contemplating their beautiful girls' bedding options before choosing the Gardners Friend Quilt Set. I was completely thrilled when the Gardners Friend Quilt Set arrived! The colors were just as bright and vibrant as they appeared online and because this set is prewashed, it already had that somewhat worn look to it which made it feel inviting and cozy. I showed Riley this set and she LOVED it! She is a huge fan of being outdoors, smelling and picking the flowers and discovering all of the bugs, worms and frogs in our garden. 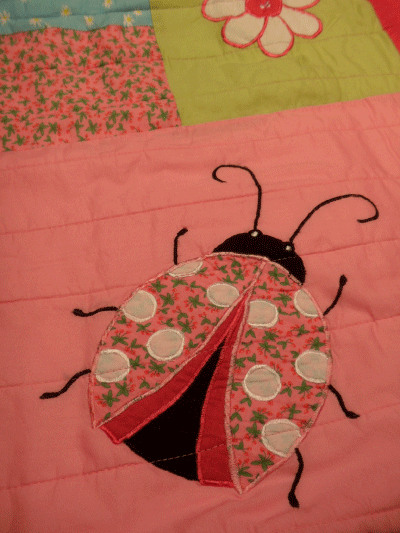 She immediately pointed to the ladybugs and flowers on her new quilt set and giggled with delight! I was really impressed at how well-sewn this quilt set was. The appliqued ladybugs and flowers were perfect and the overall look of the quilt set reminded me of actual handmade quilts I own. Once I took the set in Riley's room, I was also pleased to find that the colors in the Gardners Friend Quilt Set matched her room wonderfully. I loved the look of this set so much, that I immediately ordered the accent pillow and valance too! American Kids Bedding has helped transform my daughter's nursery into her new and improved "big girl" room. Thanks to the Gardners Friend Quilt Set, both Riley and I will be looking forward to the twin-sized bed transition much more now! 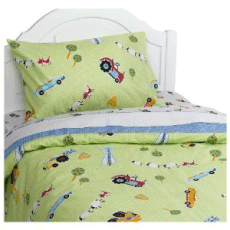 If you'd love to give your child's room a makeover this holiday season, then I highly recommend checking out the many wonderful bedding sets and accessories at American Kids Bedding. 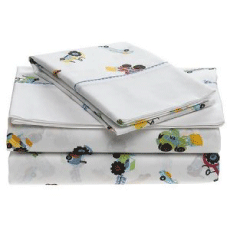 American Kids Bedding was generous enough to give my readers the chance to win a Freckles Farmyard Bedding Set, perfect for any child's bedroom! The Freckles Farmyard Bedding Set includes a Full/Queen Duvet Set (With Duvet and Two Standard Shams) and Full-Size Sheets, both in the Freckles Farmyard pattern! Disclosure: I received the Gardners Friend Quilt Set (Twin Size) from American Kids Bedding in order to facilitate my review. No other compensation was received. This product review is based on my own personal experiences with this item and is completely honest and objective.